SmartMutex - A mutex with a compile time constant parameter that indicates whether this mutex should become a no-op when we're not running in multithreaded mode. 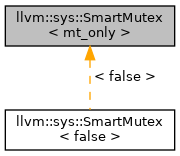 Definition at line 91 of file Mutex.h. Definition at line 96 of file Mutex.h. Definition at line 99 of file Mutex.h. Referenced by llvm::MutexGuard::MutexGuard(), and llvm::sys::SmartScopedLock< mt_only >::SmartScopedLock(). Definition at line 126 of file Mutex.h. Definition at line 112 of file Mutex.h. Referenced by llvm::MutexGuard::~MutexGuard(), and llvm::sys::SmartScopedLock< mt_only >::~SmartScopedLock().